Whenever I am sick, I like to think about the ways in which I’d have already died had I lived a few hundred years ago. Giving birth to boy #1 surely would’ve done me in. After twenty something hours of hard labor he was thoroughly stuck and it was only the magic of a numbing drug – a drug that didn’t exist back in the 1700s – that got him unstuck. Less dramatically – chicken pox. I was in the fourth grade, I think. Same age as T, who has had his chicken pox vaccine. No baking soda baths for him, no diet of pudding and popsicles, no searing pain in the night when the tylenol wears off and you are the only person left in the entire dark, dangerous world. He’ll have to mine a different vein in the soul to get ideas for his own bad poetry. My first bout of pneumonia might have put me in the grave, as would that chicken bone that lodged itself in my throat 25 years ago and refused to go either up or down. Mostly I’m grateful to live in the age of drugs-a-plenty, especially when my kiddos are the ones with fevers and pustules. But I wonder: in another two hundred years, how barbaric will we look to the more advanced race we’ll probably, hopefully have become? I’d bet money chemotherapy will have been replaced with something less…lethal. Beyond physical maladies, future generations surely won’t be at the mercy of moods. Already we have oodles of anti-depression, anti-anxiety, anti-psychotic drugs to choose from to help make our days, our lives, smoother. While I don’t take any of these right now – I self medicate with wine and BBC crime shows – I do have a huge appreciation of how these drugs help. I worry though, in a dystopian sort of way, what a future full of people free to choose their own moods might be like, all of us bubble wrapped against the pain and joy of real life, etherized upon the table, sitting in snow-drenched chairs. But honestly. Whatever works. Life is hard, harder for some than others. As long as we enter pharmaceutical relationships with open eyes, I’m sure we’ll be fine. And if we aren’t, we won’t even know. 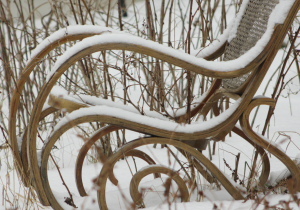 Sit, in a cold seat….